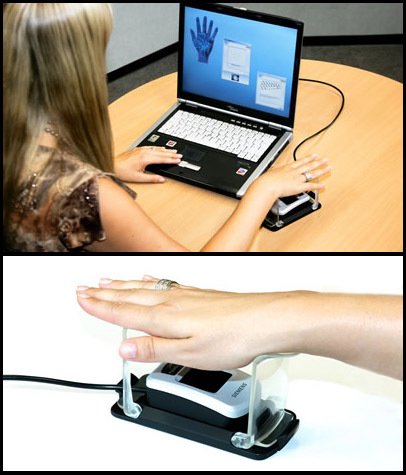 Fujitsu's PalmSecure hand vein pattern scanner is a nifty biometric security station. It's hygienic, too. Unlike most devices that require a fingerprint or other biometric information, the PalmSecure device requires only that you hold your hand up to the device. In combination with Siemens, who provides the "ID Center" biometric database software, this device opens up a new area in biometric security devices. The device recognizes the vein pattern under the palm of the hand; this pattern is unique to every individual, according to Siemens. Watch for a device like this barring your access to an ATM machine near you. SF enthusiasts will no doubt remember the palm lock from Frank Herbert's Dune, published in 1965. Surely not a palm lock, she told herself. A palm lock must be keyed to one individual's hand shape and palm lines. But it looked like a palm lock. And there were ways to open any palm lock--as she had learned at school. See also the automatic vein finder from The Andromeda Strain, a 1969 novel by Michael Crichton.